There have been a number of cockroach sightings in the Student Campus Centre (SCC) since the fall semester started. 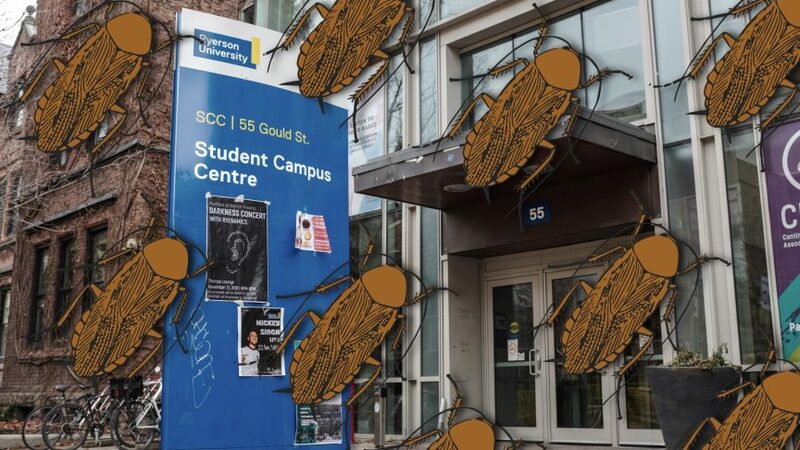 Ryerson Students’ Union (RSU) staff have spotted cockroaches on the second and third floors of the SCC on at least four occasions since September 2018. The insects have been found in the RSU’s staff kitchen and in their offices, according to RSU president Ram Ganesh. “I’m getting cockroaches in my [work] kitchen and I can’t have that. My staff eat here,” he said. Ganesh took a photo of one of the insects he saw and sent it to The Eye. Seven different exterminators—Addison Pest Control, Armour Pest Control, GreenLeaf Pest Control, HMG Pest Control, HUG Pest Control, Merkem Pest Solutions and Orkin Canada—confirmed the insect in the photograph was a cockroach. The majority of cockroaches are introduced by people, so the more people using a space like the SCC, the higher the chances insects could be carried in on backpacks or shoes, said Daniel Mackie, quality assurance director at GreenLeaf Pest Control. Four sightings of cockroaches within a span of four months isn’t “overly excessive,” according to Mackie. However, Mackie said cockroaches are nocturnal, so sightings of the insects in the daytime can, at times, signify a larger issue. Aside from what he calls “the ick factor,” Mackie said cockroaches also pose a health problem. They live and breathe in unsanitary conditions so the spread of germs is a concern, he said. When approached by The Eye, Ryerson’s Facilities Management and Development said they were not aware of cockroaches in the SCC. SCC general manager Jennifer Stacey said Orkin is on site on a weekly basis to set traps and treat individual areas in the building. The SCC houses the RSU, Continuing Education Students’ Association of Ryerson, student group offices, the Good Food Centre, Oakham Café and the Ram in the Rye, among other facilities. “At this point, we are assessing, treating if necessary and monitoring. This is our regular pest control procedure,” Stacey said, adding that the building’s traps have not indicated cockroach activity so far. 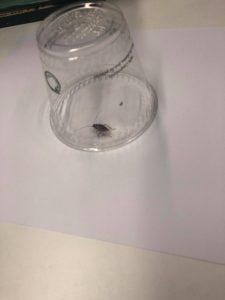 Racialised Students’ Collective coordinator Sheldomar Elliott saw a cockroach in his office earlier this month on the second floor of the SCC. He said two people installed traps in his office on Nov. 27—nearly a week after Stacey said Orkin had been monitoring traps. Neither the communications officer for Orkin or the manager of the downtown Orkin branch that oversees Ryerson’s pest control responded to multiple requests for comment about the status of cockroaches in the SCC. Treatment strategies include direct contract spray to eliminate a cockroach population, insecticide baiting or dusting, mechanical removal, or a combination of these strategies, according to Alice Sinia, an entomologist at Orkin. She did not know the status of the insects at Ryerson. In order to prevent the insects from infiltrating a space, Mackie recommends prioritizing sanitation, storing food properly and keeping spaces dry. Ganesh said he’s concerned about leakage in the SCC roof, resulting in office spaces being damp. He said he’s also concerned about the Good Food Centre and restaurants in the SCC being affected—although no insects have been spotted on any levels under the second floor. “We don’t want it to get to a spot where students are noticing it and they stop using our spaces because I know when the bed bugs thing happened in [the Victoria Building], students didn’t want to go to class,” Ganesh said. Back in March, The Eye discovered a bed bug infestation in a classroom in the Victoria Building—after the university looked into concerns about bed bugs and said they found no evidence of the insects. If the RSU continues to spot bugs in their workspace, Ganesh said he plans to get the carpeting in their offices replaced, adding that he’s worried his staff won’t want to come into the office if they feel unsafe with bugs around. Cockroaches, the pests that enter and take over your homes in scavenging for food. Once they enter the home, cockroach allergens can trigger allergies and asthma. In addition to allergens, they spread bacteria and viruses i.e. polio virus. Cockroaches have been reported to spread at least 33 kinds of bacteria, including E. coli and Salmonella, as well as six kinds of parasitic worms and at least seven other kinds of human pathogens. According to researchers, cockroaches can run up to three miles in an hour, which means they can spread germs and bacteria throughout a home very quickly. Parent cockroaches are not the only problem; their microscopic offspring can run almost as fast as their parents. Cockroaches have relatively small heads and broad, oval-shaped, flattened bodies. American cockroaches are typically reddish brown with a yellowish figure 8 pattern on the back of the head, with six legs and two antennae.